Yes! I have found my dream car. I can see me driving around town waving to everyone as if I'm in a parade and I'm the hometown beauty queen. 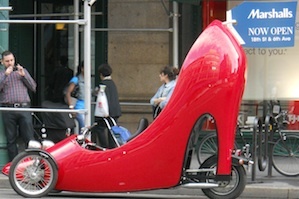 Today I will drive my high heel into town to do a little shopping but tomorrow I will drive my sandal to the beach. Life is good. What kind of car would you like?